Our range of 4 wheeler tarpaulin covers, is coated with HDPE & PP, and thus acts as protection against harsh weather conditions, especially rains. The fabric used in the fabrication process is of high grade and makes our products appreciated across the country. These are available in a gamut of sizes for the convenience of our clients. We are proficient providers of a wide variety of Four Wheeler Vehicle Covers. These covers are fabricated using high grade material to ensure lasting performance. We offer these covers in varied specifications, sizes and shapes to match the individual requirements of the clients. Further, we also offer expert customization on our entire range at nominal prices. 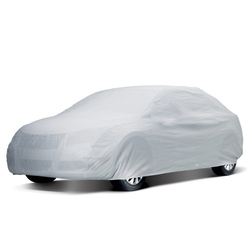 Backed with expertise and technical know how, we are proficient in presenting an excellent quality of Vehicle Cover. Height:31.5, Length: 56.5, Width: 40.5 , Weight: 3.5 kilos . We are one of the trusted companies of Car Cover. Our products are extremely well-liked in the market owing to their top features. 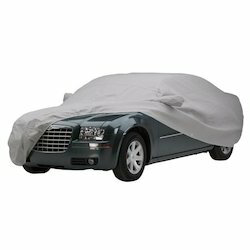 This Sedan Car Cover is made of premium quality raw materials and has a silver coated body which is waterproof and dust resistant, thus making it ideal to cover sedans.